Over the weekend, in the midst of the blizzard, I catered a 95th birthday party on the Upper East Side. The birthday boy was just the cutest. I felt like my little heart would burst every time he shuffled over for another canape. 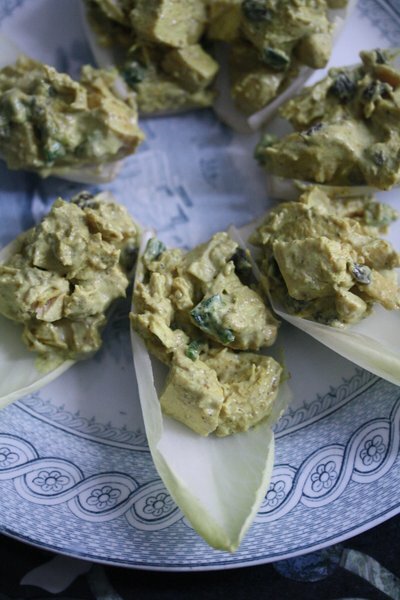 On the menu were these curry chicken salad bites in endive leaves. Being golden in hue, I thought they’d be the perfect Oscar party snack. Oscar night happens to be my favorite holiday of the year. So rest assured that I will be back next week with more themed ideas, if you want to go all out. And by all out, I mean not just your regular old crabby snacks and homemades (though I’ll certainly be making those too). Tiger Shepherd’s Pi and Hushpuppies, anyone? I’m off to the west coast this week. If there’s anything I should be eating in LA or San Francisco, let me know in the comments! Eat up, and bon voyage! 2. Place the chicken breasts on a parchment-lined sheet pan. Drizzle with olive oil and sprinkle liberally with salt. Roast for 35 to 40 minutes, until the chicken is just cooked. Set aside until cool enough to handle. Dice the chicken into small bite-size pieces. 3. Meanwhile, in a large mixing bowl, combine the mayonnaise, chutney, curry powder, and 1 1/2 teaspoons salt. 4. Place the currants in a small bowl and cover with warm water. Soak for 10 minutes, until soft and plump. Drain and set aside. 5. Add the chicken, scallions, and currants to the mayo mixture and stir to combine. 6. 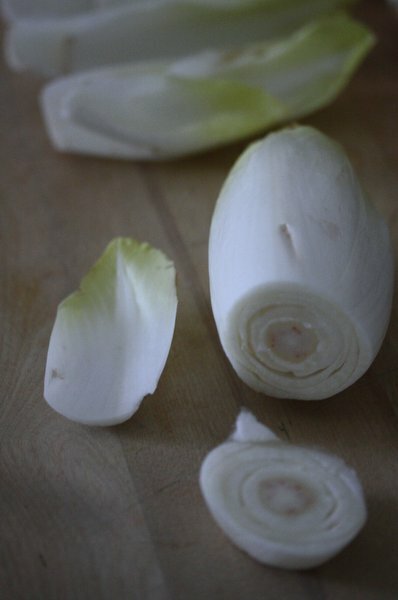 Cut the ends off the endive heads and carefully separate the leaves. The smaller inner leaves will be too tiny to use – save them for salad. Each head should give you around 15 useable leaves. 7. Chicken salad will keep for up to a week refrigerated. Stir in cashews right before you’re ready to eat. 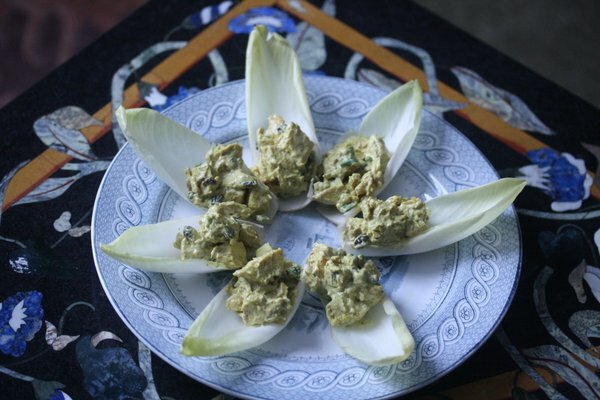 To serve, either scoop a scant tablespoon of chicken salad onto each endive leaf and arrange on a platter, or serve the leaves alongside a bowl of the chicken salad and have people make their own. 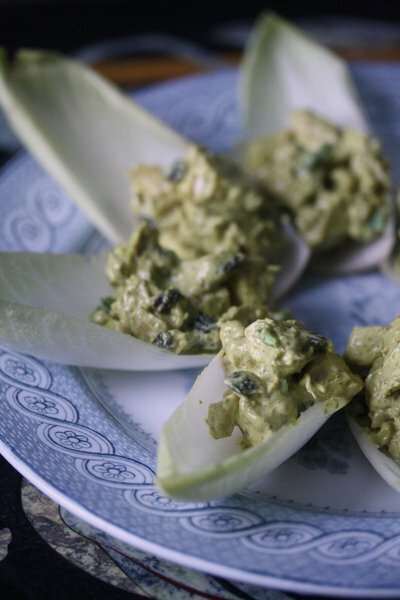 I love adding cashews to this recipe. And in LA, hit the food trucks! We wanna know all about it! 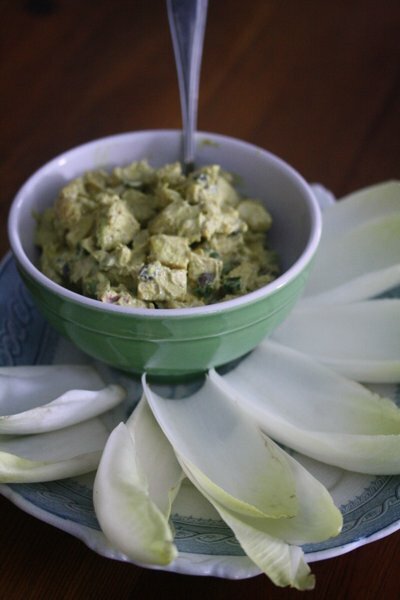 I’ve never tried curry salad before and this recipe looks worthy of a try.